• The 80-PAGE BOOK includes: detailed transcriptions by David, of his drum performance in each of eight tunes from T.O.P's most recent album "Oakland Zone" (Or Music), incisive commentary, photos, a biography,a suggested listening list and more. • The CD with all 8 tracks minus David's drums, allows you to "sit in" with this legendary band. Each track provides "clicktrack" count-in, followed by a complete "music minus drums" stereo mix including the lead vocals and solos. • The BONUS DVD-ROM with instrumental versions of these tracks in file formats that can be looped, slowed down using programs such as Acid® and GarageBand® and remixed using multi-track studio software such as ProTools®, Cakewalk®, or Nuendo® for further exploration and study. Includes a ReadMe file and also a video tutorial with detailed instructions. 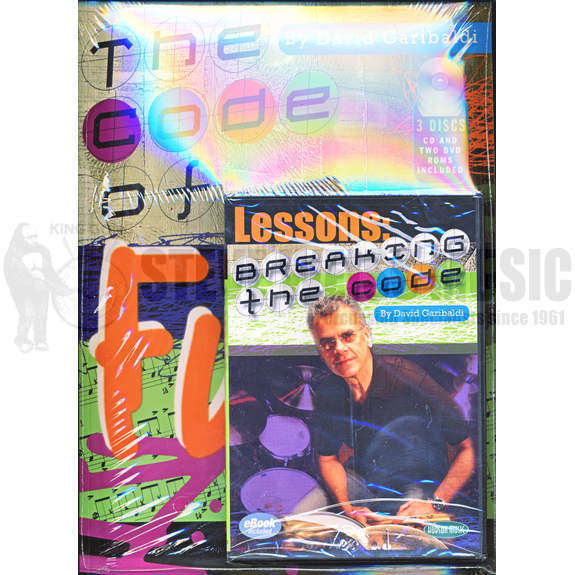 * DVD LESSONS: BREAKING THE CODE Expanding on the information in his award-winning Code Of Funk book/audio package, and drawing from his experience with the legendary Tower Of Power, world-renowned drummer David Garibaldi's new Lessons: Breaking The Code DVD provides some of the most insightful instructional content ever available on the subject of funk drumming. The comfortable sound and feel of the funk style have become the rhythmic foundation of modern rock, pop, R&B and hip-hop music, and in Breaking The Code Garibaldi offers an overview of the general concepts and techniques used to create funk drumming's characteristic sounds and infectious grooves while showcasing his own contributions to the style. This DVD is packed with features every drummer would love. This DVD is a must have for all drummers. The play along tracks are awesome, the DVD Roms are great, and the video is very educational. ALL DRUM SET PLAYERS MUST GET THIS ONE!!!!!!! !